A fully hosted and serverless running environment that takes away the need to manage infrastructure such as servers and enables developers to focus on writing and uploading code. Alibaba Cloud Function Compute is a fully-managed event-driven compute service. It allows you to focus on writing and uploading code without the need to manage infrastructure such as servers. Function Compute provides compute resources, allowing you to run code more flexibly and reliably. In addition, you only need to pay for the resources that have been consumed when running the code. No fee is incurred if you do not run the code. The fully-managed service allows you to focus more on business innovation instead of infrastructure management. You are billed based on the amount of code executed and the execution duration. The code execution duration is calculated in milliseconds. Real-time auto scaling and dynamic load balancing within milliseconds help you load shift burst traffic. Leverages the event-driven mechanism to meet the requirements in various scenarios. The serverless feature allows you to handle events more efficiently. Functions are triggered by events or called directly through the Function Compute API or SDK. Supports multiple programming languages including Java, Python,PHP, and NodeJS. Views logs from multiple dimensions with a wide range of metrics. You are billed based on the duration of code execution, which is calculated in milliseconds. Provides an event-driven trigger mechanism to easily build a full data processing workflow. By storing and uploading objects, multiple functions can be triggered to perform tasks such as transcoding and metadata extraction. With this event-driven model, you can quickly integrate different services to build an elastic and highly available backend video system. An elastic and highly available backend video system allows you to pay for only the consumed resources. Provides a distributed system architecture and Alibaba Cloud-developed high-performance cache software for stability and performance. Function Compute and API Gateway are used to build backend services to verify and manage API requests. 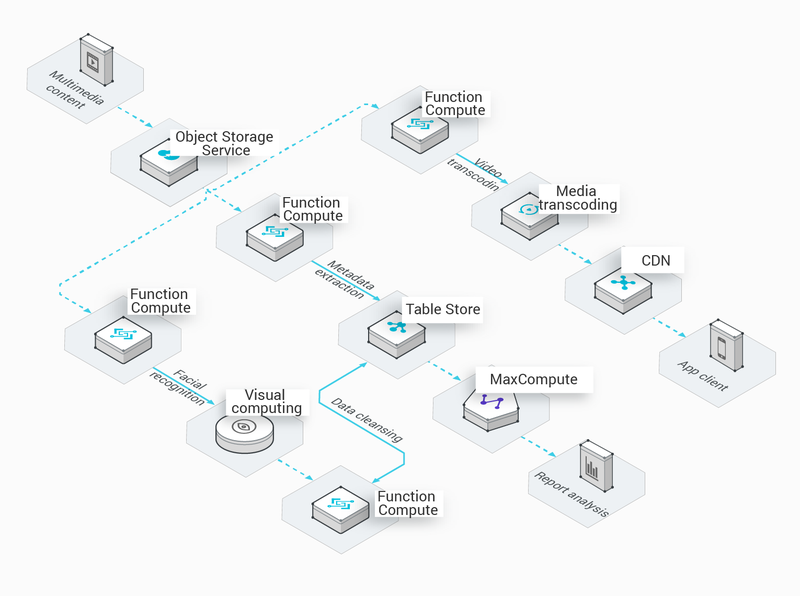 The flexible serverless architecture enables you to scale up or down to handle changes in requirements and build various applications. 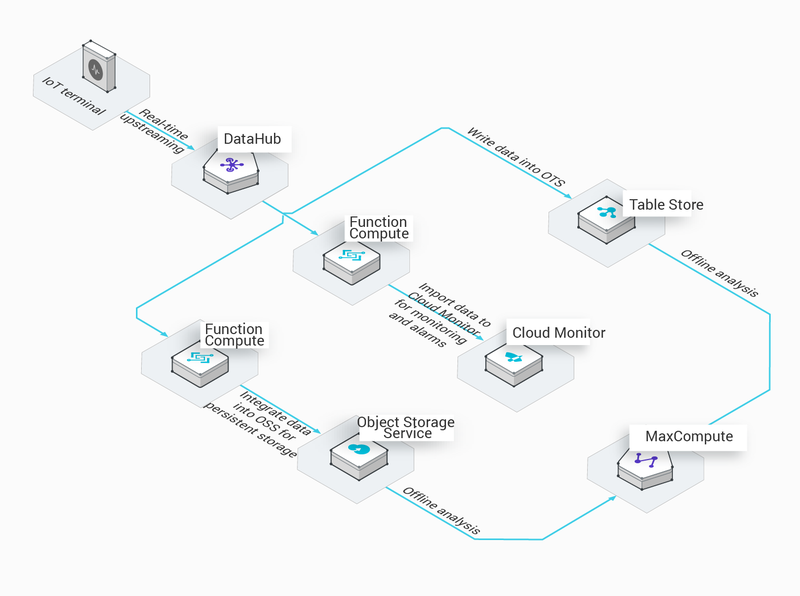 An event-driven model that integrates multiple cloud services to support your compute needs in various scenarios. This model offers convenient and efficient services. You can efficiently process real-time data streams. For example, you can filter, aggregate, and analyze data that is generated by IoT devices in real time, and save the structured data into databases. Real-time automated scaling and dynamic load balancing within milliseconds help you shift the peak load and handle traffic surges with ease.